Despite their economic and social differences, Addison Allen and Harley James have been inseparable since sixth grade. But when Harley is arrested for the murder of her ex-boss, prison bars threaten to be the one thing that finally comes between them. The body left on Harley’s doorstep proves to be too problematic for even Addison’s enormous bank account, forcing the duo to roll up their sleeves and search for the murderer themselves. Working to prove Harley’s innocence brings out an unexpected passion for investigating a knack for uncovering the buried truth. However, their freshly-acquired skills propel them into a dangerous new world full of lies, secrets, and quite possibly…romance. Will they be able to keep Harley out of jail? Or will they lose their hearts, and maybe even their lives, in the process? Dial L For Lynda had me laughing out loud. Addison and Harley are in their early twenties and their youth is reflected in their sharp, sassy, and hilarious dialogue. They certainly know how to turn a serious situation into an act of comedy. In addition to the abundance of humour, there is a very good murder mystery behind it all. Harley's life is on the line as she is considered the main suspect. Having little faith that the police will capture the real killer, Addison and Harley take it upon themselves to help the investigation along and solve the case. 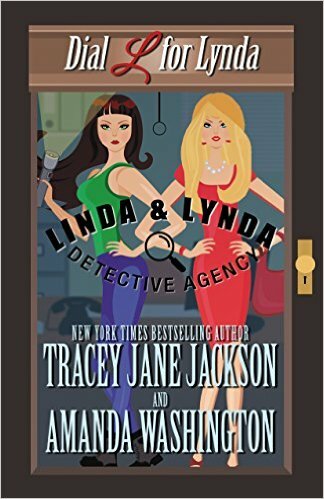 I loved the romantic interests for the two ladies as well and I can't wait to see how Addison and Detective Jake get on in the next book. Their teasing and arguments are comedic and cute while Harley's relationship with Addison's brother is a little bit more real and grown up. The pair are childhood friends who have fallen in love but need a little push to move out of the friendship zone. I loved every minute of this book and I can't wait for more. Dial L For Lynda will be available to buy from the first of May. I received an early copy in exchange for an honest review.